Lock in a great price for Crowne Plaza Istanbul Asia – rated 8.7 by recent guests! Staff very friendly and welcome. Spaceious Lounge with Starbucks coffee available. Lobby balcony quit good for a fresh breath taken over looking to the shopping outlets. The staff are very help full. The front desk excellent and cooperative. I like having Arabic staff in the front desk ( the lady name is SEVTAP) she is very helpfull and she made my counication easy with the hotel. Thnk you Crown Plaza to recrote such staff. The room was very spacious and very clean. 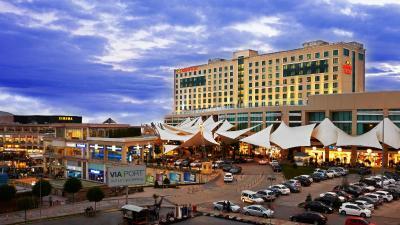 The hotel is located next to an outdoor mall which is convenient which has a large Migros in the front of the outlet mall. The Sabiha Gokcen Airport is also very close. The staff were very professional and very polite. Location adjacent to via port outlet. Very good breakfast. Crowne Plaza Istanbul Asia This rating is a reflection of how the property compares to the industry standard when it comes to price, facilities and services available. It's based on a self-evaluation by the property. Use this rating to help choose your stay! One of our top picks in Istanbul.The Crowne Plaza features an indoor pool, a wellness center offering aromatherapy sessions and a fitness center. 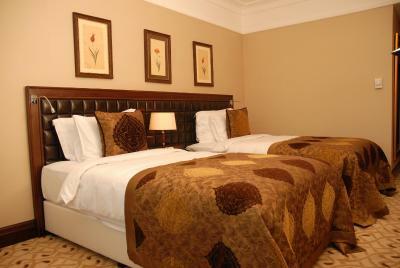 Located next to Via Port Outlet Shopping Center, it offers deluxe rooms with free WiFi. 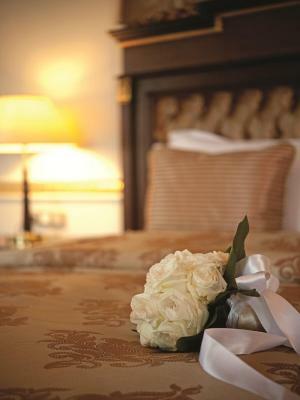 Each room at Crowne Plaza Istanbul Asia features luxury bedding and carpeted floors. Each one has a flat-screen TV, a work desk with an ergonomic chair and a plush armchair in the seating area. Belvedere Restaurant and Bar is a chic restaurant serving international dishes and regional specialties including lamb stews. Turkish tea, international coffees and cakes are available at the Lobby Lounge. At Crowne Plaza Istanbul Asia, guests can enjoy a refreshing swim in the indoor swimming pool or relax in the hot tub. Leisure facilities include billiards and darts. The Crowne Plaza Istanbul is 1.9 mi from Sabiha Gokcen International Airport while Istanbul Airport is 54 mi away. The Formula 1 circuit is 3.1 mi away. 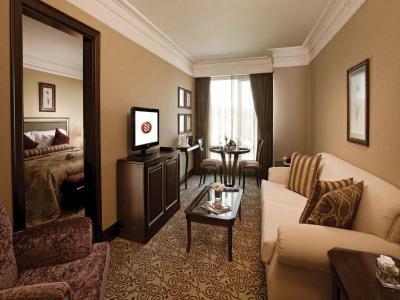 When would you like to stay at Crowne Plaza Istanbul Asia? 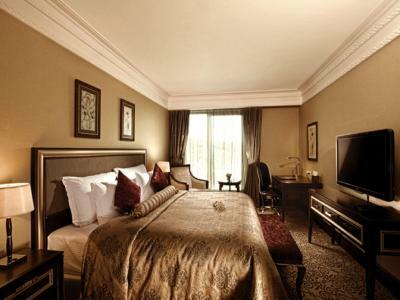 On the 1st, 2nd and 3rd floor, these rooms have tea/coffee making facilities, 32” flat-screen TV, and marble bathroom. This spacious suite includes a bedroom and a living room. It provides access to Executive Club benefits. 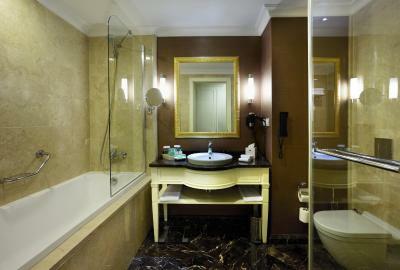 It also features an iPod docking station, spa tub, 32" flat-screen TV, and a minibar with a 50% discount. 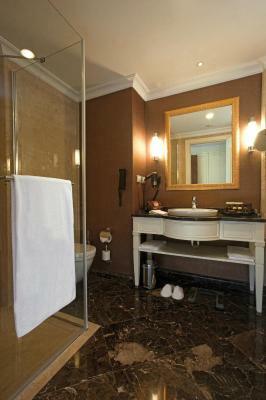 The marble bathroom includes velvet bathrobes and Bvlgari toiletries. On the 7th and 8th floors, these rooms include access to Executive Club. They feature a 32" flat-screen TV, tea/coffee making facilities and an iPod docking station. The marble bathroom has velvet bathrobes. This room has a 32" flat-screen TV, tea/coffee making facilities and a laptop safe. The marble bathroom has velvet bathrobes. The guests of this room receives complimentary fruit plate upon arrival and free coupons for alcoholic and non-alcoholic drinks to be used at the lobby bar. This suite features a dishwasher, satellite TV and mini-bar. House Rules Crowne Plaza Istanbul Asia takes special requests – add in the next step! Crowne Plaza Istanbul Asia accepts these cards and reserves the right to temporarily hold an amount prior to arrival. The breakfast is very good, the place is very clean and the location is very close to shopping outlets and restaurants. The staff was helpful and overall the service is excellent. The Hotel is good in general, it depends on your purpose... close to the airport if you are looking for an overnight stay. Via port outlet mall is connected to the hotel... okay for shopping even though prices are the same as anywhere in Istanbul, not a real outlet. Room size is very good, great breakfast. Wi Fi internet is very slow and weak. room is good, big, clean and comfortable.